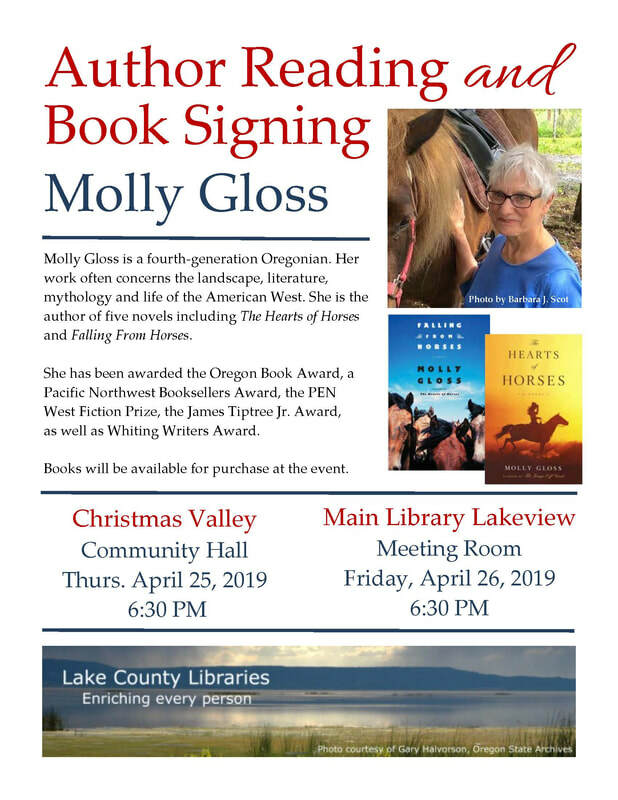 Spend an evening with best-selling Oregon author Molly Gloss hosted by your local library in Christmas Valley on Thursday, April 25, 2019 and in Lakeview on Friday, April 26, 2019, both at 6:30 PM. A fourth-generation Oregonian, Gloss’ work often concerns the landscape, literature, mythology and life of the American West. Gloss’ five novels, including The Hearts of Horses and Falling From Horses, span the time from homesteading the northwest in the 1890s to a near future space colony. “[To] my way of thinking, there’s a continuous line between historical fiction and science fiction. We are every bit as distanced from the past as we are from the future,” says Gloss. This free public program is most suitable for adults and teens and is made possible by the Lake County Cultural Coalition and the Friends of Lake County Libraries. 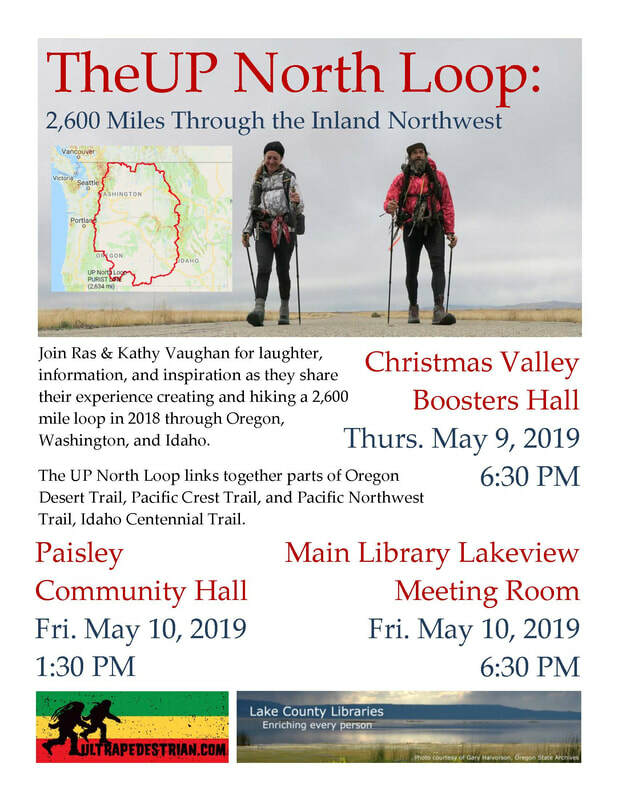 For more information about this program, please contact Library Director Amy Hutchinson at 541-947-6019 or amyh@lakecountylibrary.org. Connect with the author at mollygloss.com. First Year of Imagination Library a Great Success! ​In 2018, Lake County preschoolers received 1,746 free books mailed directly to their home by the Dolly Parton Imagination Library, thanks to the Friends of Lake County Library, the 93.5 The Goose, and dozens of local businesses, organizations, and individuals. As of December 31, 2018, over 200 Lake County kids were registered for the program, which mails a free, age-appropriate book per month to children under 5. Parents can register their children at any time at their local library or online at imaginationlibrary.com. The Imagination Library is free to every Lake County child under 5 no matter their income. The goal of the program is to inspire a love of reading, which is a key indicator of future school success. Parents are encouraged to register their preschooler today to bring home the benefits of reading together. Studies have shown that when parents read to their children, kindergarten readiness improves. Parents reading to their children from birth can have lifelong positive benefits. The Imagination Library puts books directly into children’s homes, and research has shown significant positive benefits for children in the program. The program costs local sponsors $25 per child annually. If all eligible preschoolers registered, the program would cost over $8,000 per year. Fortunately, an Oregon family foundation will cover half of the local costs for the first three years. The Friends’ are over halfway to their goal of beginning each year with two years’ full operating costs in the fund. If you would like to support the program, stop by your local library and make a donation or mail a check to Friends of Lake County Library at 26 South G Street, Lakeview, OR 97630. Questions about the program may be directed to your local library or Amy Hutchinson, Library Director, at 541-947-6019. ​LAKEVIEW, Ore.—December 28, 2018— The Main Library’s new power source is up and running. The 78 solar panels on the building’s roof are expected to produce about 1/3 of the power needed for the library annually and save the library more than $25,000 in energy costs over the first 10 years. Click here to see how much power the panels are producing. The 23.4 kilowatt rooftop solar system was made possible with funding support from Pacific Power’s Blue Sky program customers through a $65,000 grant award. The library was able to raise the additional $8,500 needed to complete the project through local community donations. Adding solar panels to the highly efficient ground-source heating and cooling system brings the Main Library close to a net-zero building. “We can’t thank Lake County Resources Initiative, Oregon Clean Power Cooperative, Sunlight Solar, and Pacific Power’s Blue Sky customers enough for making our solar power dreams come true,” said Amy Hutchinson, Library Director. 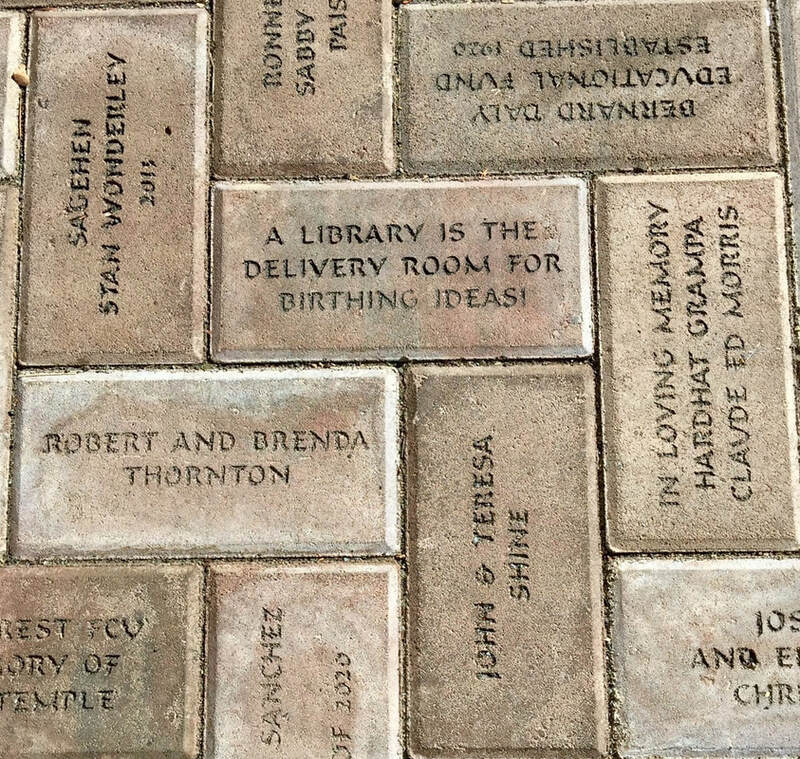 “The team made the complicated process of designing the project, applying for the grant, and installing the project so easy on the library, returning valuable tax dollars to library services for many years to come,” Hutchinson said. This solar development project is part of a statewide effort to install solar energy systems on nonprofit and government facilities. In 2017, Lake County, Hood River County, and Douglas County teamed up with Sustainable Northwest to compete in the U.S. Department of Energy SunShot: Solar in Your Community Challenge. Oregon Clean Power Cooperative is supporting the SunShot team’s efforts through its unique community financing model, which allows community members to invest in local solar projects. Lake County Resources Initiative (LCRI) works to promote and share an understanding of the inter-relationships between people and their environment. LCRI believes that promoting healthy ecosystems and natural resources products can provide economic opportunities to local communities. The Oregon Clean Power Cooperative is the only state-wide cooperative in the U.S. dedicated solely to community-owned renewable energy. 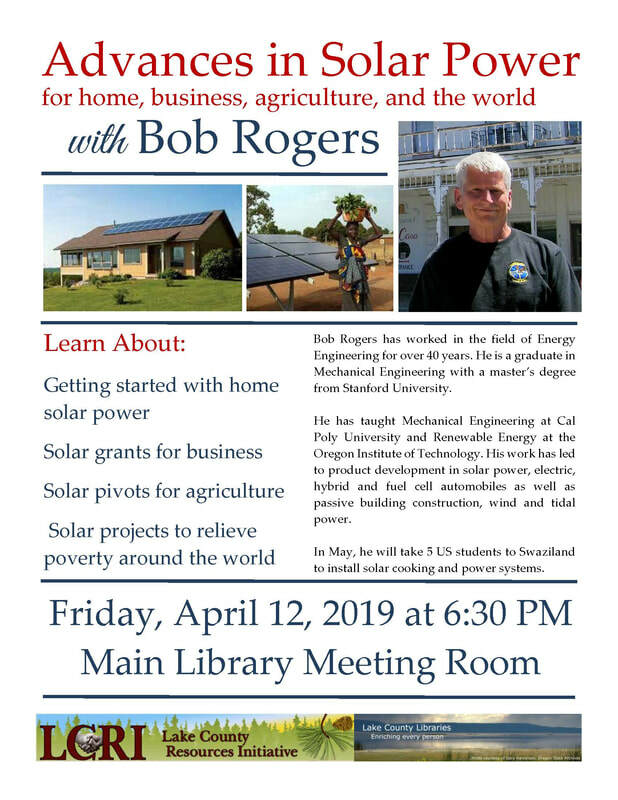 Their member-financed projects keep capital circulating locally, create green jobs, and enable Oregon communities to become more self-reliant through locally-generated clean power. Lake County Libraries will be hosting a free Preschool Family Fun Night for families with preschool-aged children. The whole family is invited to join us for dinner and fun learning activities to help preschoolers get ready for kindergarten! Parents are a child’s first teacher and know their child best. Children learn best by doing, and they love doing things with their parents. Preschool Family Fun Night is primarily targeted at children aged 3 to 5 and their parents. Families will have fun with books, crafts, songs, and activities that help prepare preschoolers for kindergarten. Older or younger siblings are also welcome to attend. ​“We are so excited to offer these great programs to help families have fun while getting ready for kindergarten. We learned a lot from Judy Springer at Lake County School District 7 and hope to help many Lake County families create young readers,” said Library Director Amy Hutchinson. 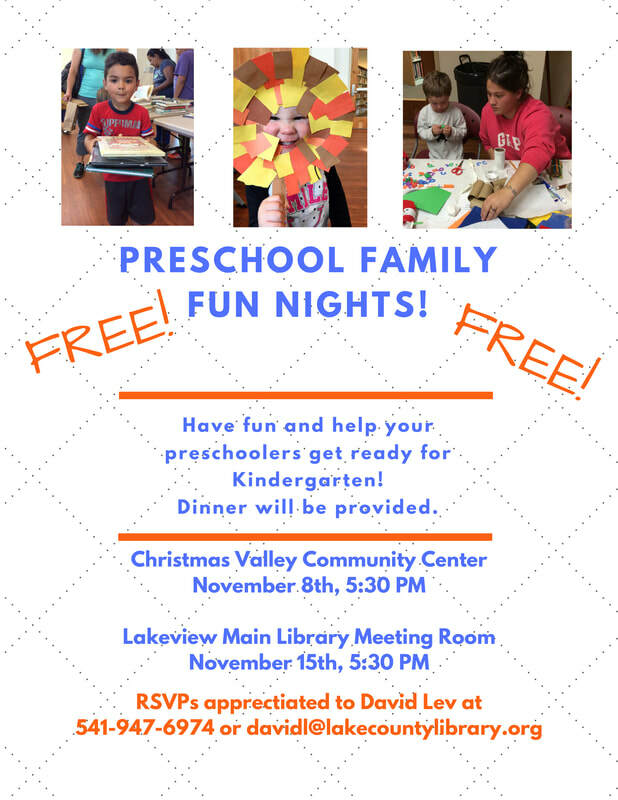 The first two Family Fun Nights will be at the Christmas Valley Community Center at 5:30 on Thursday, November 8th and the Lakeview Main Library Meeting Room at 5:30 on Thursday, November 15th. 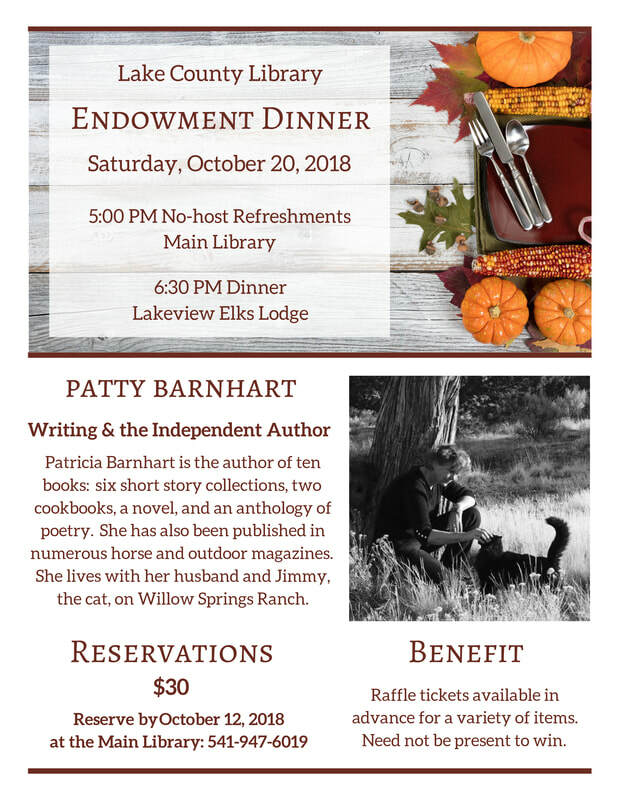 RSVPs are appreciated and can be made to Youth Library Assistant David Lev at 541-947-6974 or davidl@lakecountylibrary.org. Hope to see you there! Programs are supported in part by the South Central Oregon Early Learning Hub. 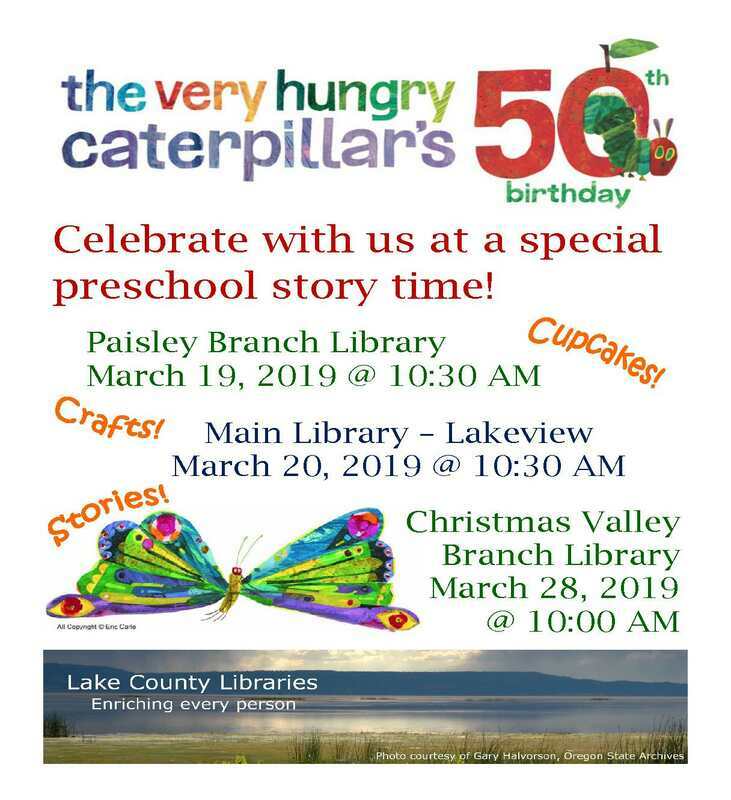 For more information about this program, contact David Lev at 541-947-6019, log on at www.lakecountylibrary.org or come to your local library! For more information about the South Central Oregon Early Learning Hub contact Gillian Wesenberg at 541-440-4774 or go online to https://douglasesd.k12.or.us/early-learning-hub/home.